Sandwiches. Yogurt and fruit. Bagel with cream cheese. Fruit snacks. Granola bars. Cookies. Fruit juice. Water. Chocolate milk. I’ve packed all of these items and then some over the years. I can pack my children’s lunch bags in my sleep. I can reach into the pantry and pull out what I need in 20 seconds flat. I can wake up five minutes late, pack a couple of lunches while simultaneously making breakfast, signing permission slips, helping kids find their shoes and coats, and hustling the kids to the school bus. I’m a lunch-making ninja. I’ve made school lunches for 14 years. 14 LONG years. I know my way around a pantry. Blindfolded. I can pack a bagged lunch in my sleep. I know the exact location of the kids’ favorite snacks in the grocery store when I shop. To tell you the truth, I’m a tad tired of the whole lunch-packing process. I’m weary. I’m tapped out on what to put in the lunches. The kids are fed up with their bagged lunches, too. But make lunches I must. I’m always looking for different items to pack, so it was timely when I was contacted about reviewing a few new snacks and a few old snacks. I’m always on the lookout for something to spice up the school lunch bag. Coco Joy Kids — Replace juice boxes with 100% natural, low sugar juice bottles. Coco Joy Kids is a naturally fruit-flavored pure coconut juice, which is only 30 calories. The bottles are themed for Disney Frozen and Disney Planes Fire & Rescue. I couldn’t persuade the kids to try the Coco Joy Kids juice, but I was surprised how refreshing the drink was. I don’t usually like coconut, but the coconut taste was very subtle. Welch’s Fruit Snacks — Mixed Fruit and PB&J — Replace the candy bar with Welch’s Fruit Snacks. We all love Welch’s Fruit Snacks, so the sample packs were quickly gobbled. 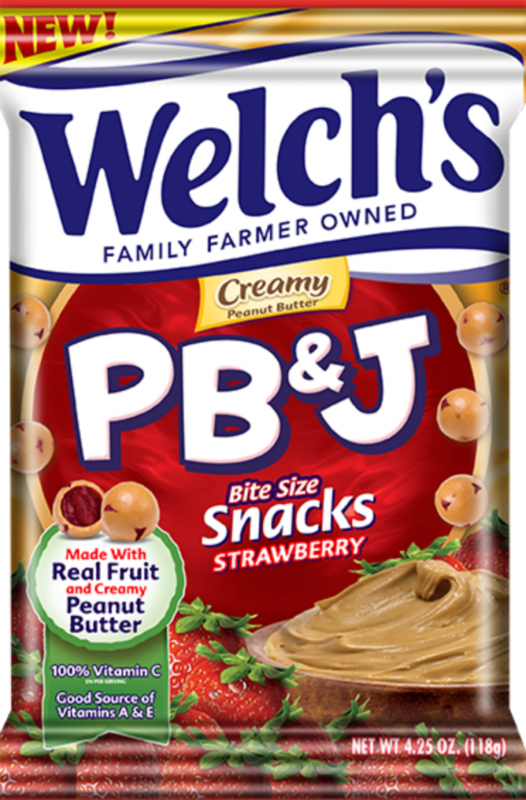 I was VERY surprised at how much my son like the Welch’s PB&J Bite Size Snacks Strawberry. He DEVOURED them BEFORE I could put them in his lunch bag! Sparkling ICE — Replace sugary, high-calorie sodas with a naturaly slightly sparkling water. Sparkling ICE has zero calories, is gluten free, sugar free, and has vitamins and healthy antioxidants. Lance Whole Grain Cracker Sandwiches — Replace the chips with Lance Whole Grain Cracker Sandwiches. These snacks have no trans fat and have 11 grams of whole grain per serving. Available in Cheddar Cheese, Sharp Cheddar Cheese, and Peanut Butter. I’m so glad to see some healthy snacks and drinks on your list. I always try to eat healthy, and ofcourse I look carefully what my child eats. We use Welch’s here too! I’m going to buy some of the P&J later tonight! Those would make the perfect addition to any school lunch bags! The coconut juice boxes sound great! I never send boxed drinks of any kind because I’m concerned about the sugar but those seem like a great alternative. Wait, Welch’s now has PB&J snacks?! I have got to see if I can find these at my local stores, I know my kids would LOVE them! Y’all. I’m not even kidding. I’m looking for the fruit snacks tomorrow!!! Holy cow those look awesome!!! Oh my son would love these!! My daughter would love those!! We love their grape juice so I’ll take anything they offer. It’s a very good brand.